If you are not a singer, but you love being a part of the music business, perhaps a career in music production is for you. Music producers work in several different environments, including film, stage, and concerts, for example. But the most common place you find them is in a recording studio. Expert producers are needed to orchestrate the recordings, direct engineers to maintain suitable audio levels, and check the overall quality of a production. Some music producers go on to have their own recording studios and some are musicians, as well. To become a music producer, you need to love music. Someone who is or was a musician, who enjoys working with technology, and can think “on the fly” would be a good candidate for this career. You may sometimes be “on the road,” especially if you choose to travel with a particular band or singing group. Music producers often have a degree from a 4-year institution or an arts school which focuses on the production end of this business. You could get a similar degree in either Radio-TV or a similar program, and minor in Music then combine your skills to become a music producer. Some music producers were musicians first. Perhaps they went on the road to perform but didn’t make enough money to make ends meet. These people can become producers instead. 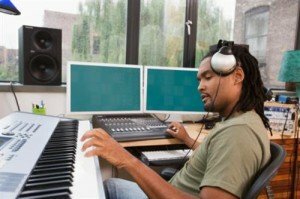 There is usually more work to be found working the technical end of the music business than the performing side, since “everybody wants to be a rock star.” If you can offer a band or production company your skills on the technical end, you may later get a chance to perform as well, if that is your desire. 1) Get a degree in audio production and/or music. Either route is fine, as long as you focus on the end result. Music production, as its name implies, focuses on the end product-the show, the media, or the mp3 that is marketed to people in the hopes of making sales. You are focusing on creating a product, and this also involves some marketing as well. With a degree or training in music and/or production, you will be able to offer more than if you just had a garage band once. 2) Build a portfolio of your work. Just as anyone who works as “talent” in the arts should do, producers should also build a portfolio of work they have done in their field. If you have produced a school musical, been involved in church sound systems, played and engineered a benefit concert, or any other experience, document this. Have a portfolio displaying your talent and add to it as you gain more experiences. 3) Build a social media following. Using FaceBook and Twitter to gain fans is a great idea. The fans should be primarily musicians, because they may need you to help them with their next CD or music concert. Focus on building an audience who may need your services in the future or can recommend you to others. 4) Use media to promote yourself. Nothing speaks louder than a great sound clip of a production you did if you are trying to establish yourself as a professional music producer. Post recent videos of your sound recordings on FaceBook or have your own webpage and post announcements about new work on Twitter. Also, make a You Tube video which showcases your talent, so you will drive traffic from other sources too. 5) Join ASCAP or a music producer’s association. Being affiliated with the professional music industry can go a long way toward keeping up-to-date on the latest music trends, knowing the professional ethics and regulations, and networking with others in the business. If you want a career as a music producer, you need to know two things: Music and Technology. Especially nowadays, with the move toward high-tech equipment, mobile technology, and social media, even if you learned on the old analog systems, it’s time to move up to the future. So keep your training current, take a new course, learn the new digital formats, attend a music production workshop, then go get some gigs! The only way anyone ever really mastered something is to get their feet wet! But just make sure the amplifiers aren’t plugged in when you do! There are many paths to reaching your goals as a music producer.